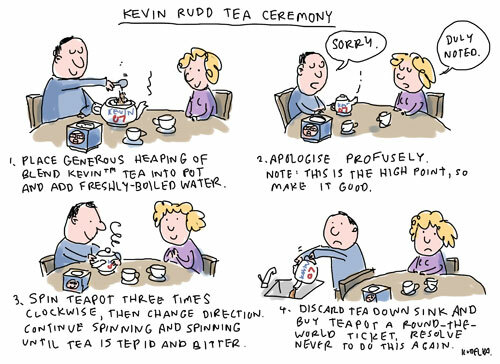 If Kevin were still PM, there is no way he’d have time to create his own blend of tea, which, I am reliably told, will solve climate change, create peace in the Middle East and be the catalyst for the formation of an Asia-Pacific Union that will lead the world into a new age of economic prosperity. So thanks, Julia. Nothing like a nice cup of tea to sort out the world’s problems. I’m just going to come out and say this: while as over-the-top weddings go I heard the other night was to *die* for, I still don’t see how that makes it any less ridiculous that some Pom is our head of state. I note some eyes bulging ‘neath well-tugged forelocks and I say to you, just keep it to yourself. 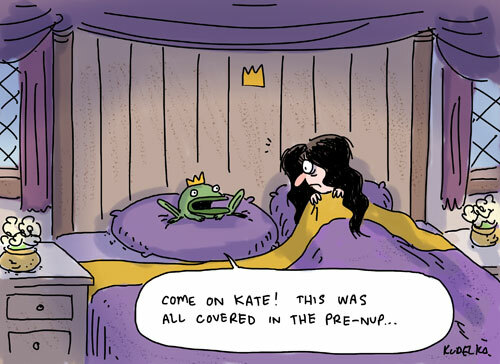 A monarchy in this day and age is silly. 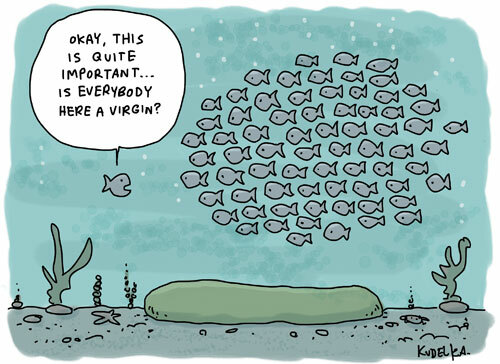 Royally silly. That is all. 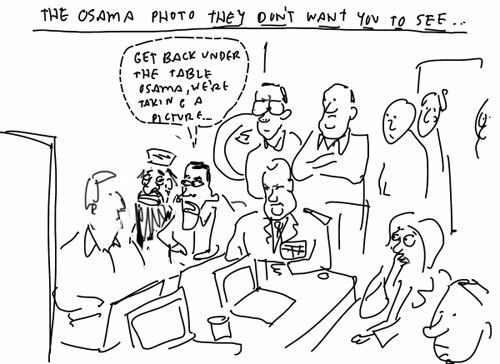 Anyway, I did a few cartoons about it, which probably proves that I’m even sillier. 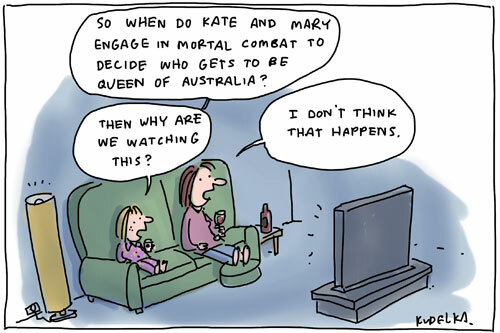 Here’s the other one from the Sunday Tele. In case you were wondering, it’s chocolate. 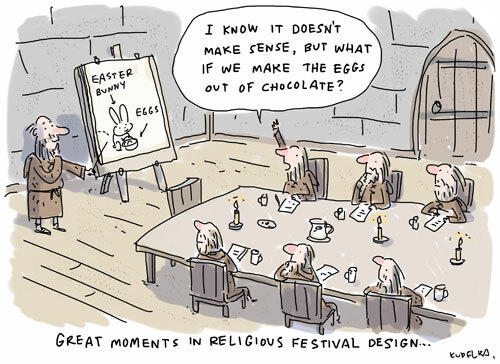 It’s all about the chocolate. 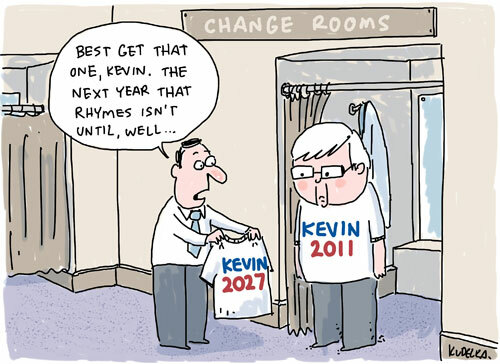 There’s been a bit of chat about Kevin having another crack at being Prime Minister, andÂ while it’s a fair bet that either the chatters, or Kevin (or both) are somewhat delusional, going by the Howard Maxim that the times will eventually suit anyone, it’s either this year or a fair old wait until the next annus rhymus. Just lucky his first name isn’t “Orange”.